Ralph Savelsberg, also known as Mad physicist, is an actual physicist, but he's not all that mad. He has been building with LEGO ever since he could first put two bricks together. He primarily builds scale models of cars and aircraft. You can find most of Ralph's stuff on his flickr pages. In a few months’ time, I’ll be attending Japan Brickfest in Kobe. I always find the prospect of displaying a model at an event motivating. So, for this occasion I am building a few new models with a Japanese twist. 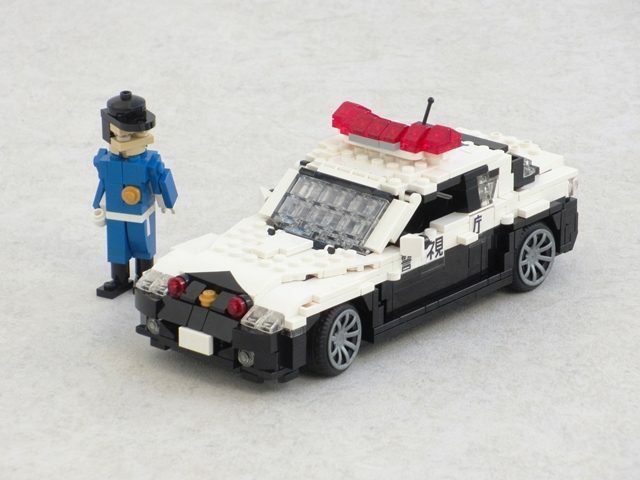 I presented my Tokyo Police car a little while ago and I’ve now completed an ambulance to accompany it. 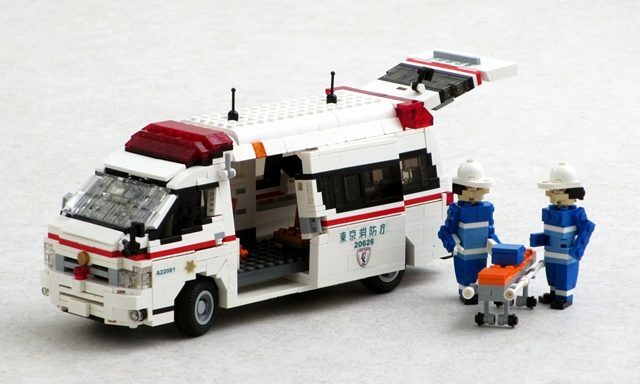 The typical Japanese ambulance is a Toyota HiMedic van. 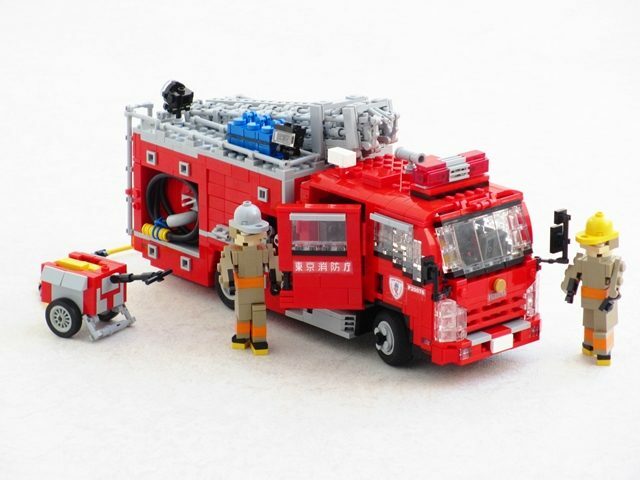 Mine represents an example used by the Tokyo Fire Department. At a first glance it may look like a box on wheels. That box is a lot wider near the bottom than near the top, though. I got the sides to taper by attaching them to hinges, but getting all of this to fit was a challenge, in particular around the windscreen. Despite the angled sides, all the doors open, including a sliding door on each side of the van. I really enjoyed making the stickers. I got to draw kanji letters and little emblems that depict Kyuta-Kun, which is the super cute Tokyo Fire Department mascot. The end result looks very Japanese and suitably futuristic. Picture this with two nacelles instead of wheels and it wouldn’t look out of place in the shuttle bay of the Starship Enterprise. Befitting a culture known for politeness, these ambulances have a PA system with recorded sentences that kindly warn other road users to make way. 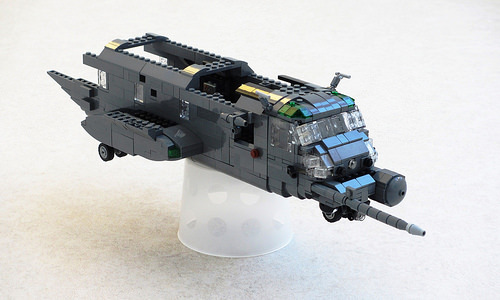 That detail, unfortunately, is missing from my LEGO model. Lately I’ve been on a bit of a building spree. 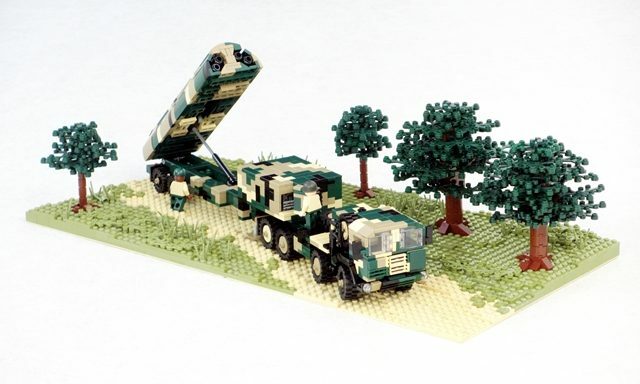 The Cold War collaboration for BrickFair Virginia, for which I have already built the SS-20 Saber and Gryphon GLCM transporter erector launchers, has given me lots of ideas and motivation. So far I have focussed on Cold War doomsday weapons that never saw use in anger. The actual armed conflicts that took place during the Cold War, although certainly brutal, fortunately were fought using conventional weapons. One of these was the Korean War. In 1950, when Communist North Korea invaded South Korea, the US and a number of allies came to South Korea’s aid. At the time, the first jet aircraft were already in service. However, propeller-driven aircraft still had a role to play. Most US Navy aircraft carriers still had several squadrons of Vought F4U Corsairs on board. This WW2 design may have seemed like an anachronism, but the veteran warbird could carry more weapons and spend more time overhead than faster jet fighters. They were the workhorse of US Naval aviation. The cruise missile that ended the Cold War? At the moment I am building models from the Cold War for a collaboration with my friends at BrickFair Virginia. I already presented my Soviet SS-20 “Saber” about a week ago. That missile platform was seen as a direct threat to Western Europe. Whilst I was buying parts for that, I was already planning to build one of the weapons systems that NATO fielded in Europe: the BGM-109G Gryphon ground-launched cruise missile (GLCM). Or, more precisely, the vehicle used to transport and launch them. It consisted of a large German-built MAN truck that pulled a semi-trailer with the launcher. This housed up to four cruise missiles in a box that was elevated to an angle of 45 degrees before launch. I built the vehicle to a scale of 1/43, making it roughly 53 studs long. Building its four-tone camouflage scheme (with dark green, dark tan, tan and black) was a challenge, especially on such a small vehicle. A little more than forty years ago, with the Cold War still in full swing, the Soviet Union introduced a new ballistic missile: the RSD-10 “Pioneer”. 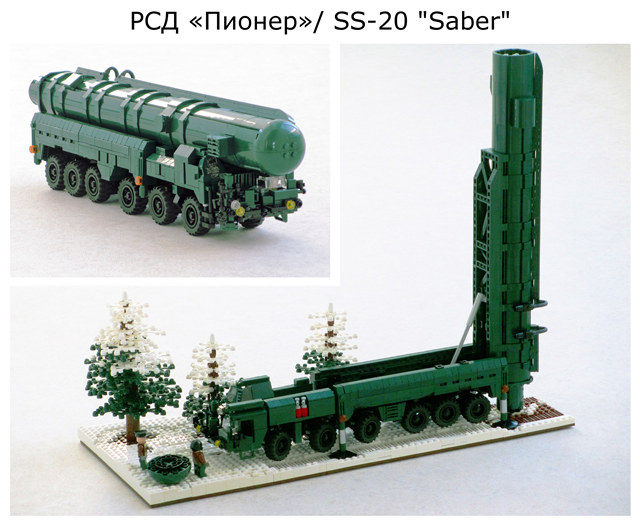 NATO code-named it the SS-20 “Saber”. It had a range of 500-5500 km and carried three nuclear warheads, each of which was roughly ten times as powerful as the bomb used against Hiroshima. It seemed purpose-built to threaten Western Europe. The missile’s short flight time, of roughly 15 minutes, left very little warning. Furthermore, it was mobile, which made it even harder to counter. A large six-axle MAZ-547 transporter erector launcher carried the missile, housed inside a large cannister, to dispersed launch sites. My diorama shows the launcher at a snow-covered launch site, with the missile cannister raised upright for launch. On the model it is almost solid, so there is no actual missile inside, but you can just see the tips of the three warheads. 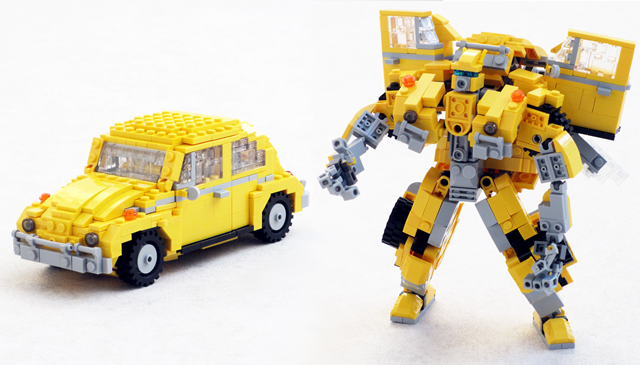 Unlike most of my models, it is minifig-scaled (I picked 1/43) and built mostly without visible studs. I built it for a Cold War themed collaborative build for BrickFair Virginia, in the coming August. For decades, the Long Island-based Grumman Corporation was the US Navy’s primary aircraft supplier. 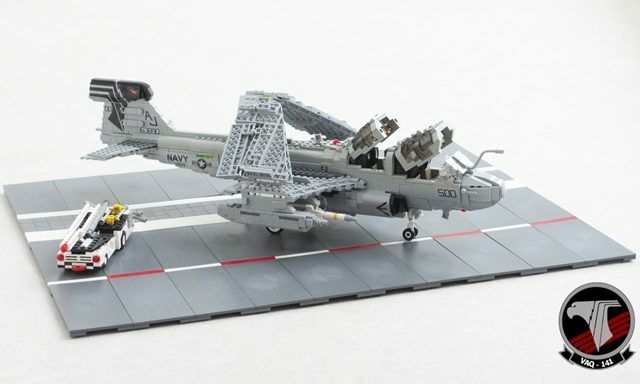 They built a range of now-famous aircraft, including the Wildcat, Avenger, Hellcat, Cougar and, of course, the Tomcat. Starting in the early seventies, they also built the EA-6B Prowler; a four-seat electronic warfare aircraft for jamming enemy air defenses. I’ve had a model of one of these since 2007. In recent days I rebuilt it using new parts and techniques. Thanks to curved slopes and a lot more sideways building, I’ve been able to improve the shape. Prowlers entered US Navy service in 1971 and, after a career of more than 40 years, the US Marines have only just retired their last examples. Their longevity is a testament to the quality of the design. 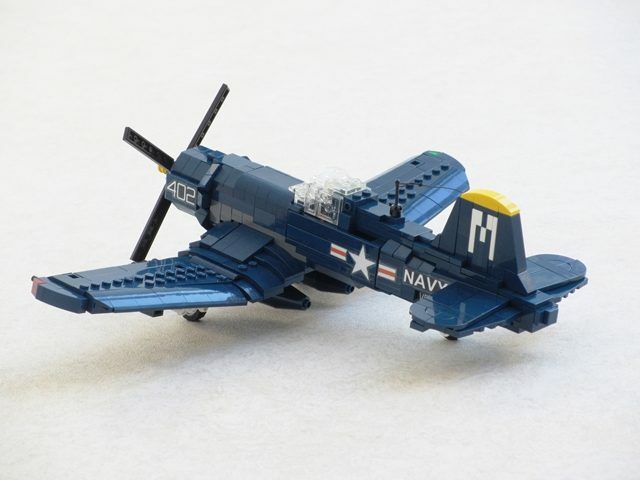 Because its products were famously well engineered, Grumman was also known as the “Iron Works”. Their aircraft, however, aren’t exactly famous for their elegant looks. Even the Tomcat, arguably one of the prettiest fighters ever to grace an aircraft carrier’s deck and certainly one of the company’s prettier products, looks quite ungainly from some angles. Also known as the “flying drumstick”, the Prowler is no exception. It has a fairly large front end, which houses two separate cockpits, each with side-by-side seating for two crewmen. The large “football” on top of the vertical fin contains jamming equipment, as do wing-mounted pods. The wings fold up for use aboard aircraft carriers. For air-to-air refuelling, it has an oddly-cranked probe just in front of the windscreen. It all makes sense, but it’s not pretty. I think “purposeful” is more appropriate. It’s done! 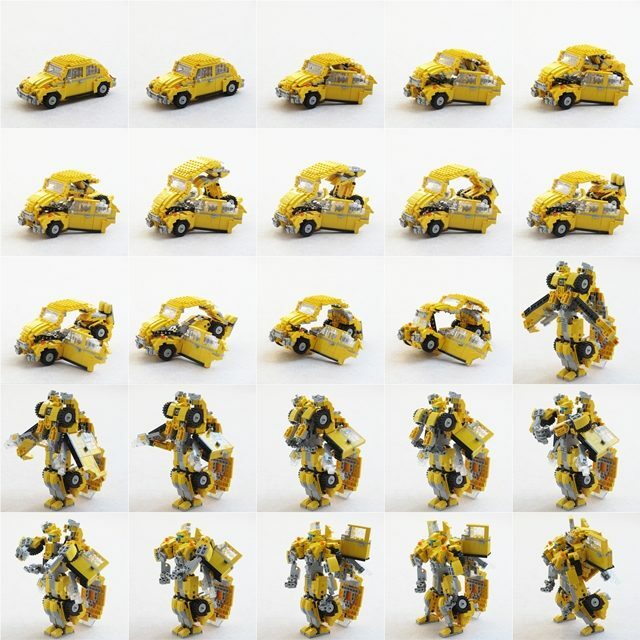 Building my Transforming Bumblebee distracted me for a bit. 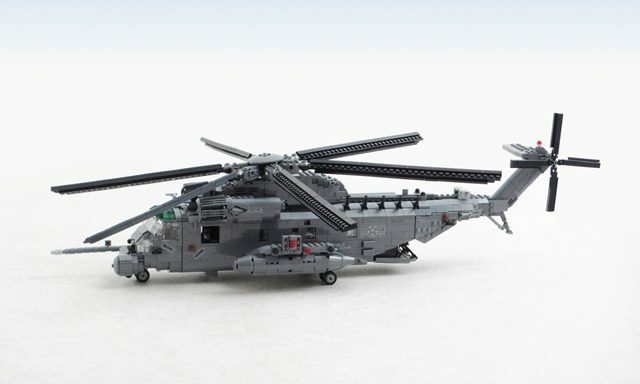 However, I actually completed my Pave Low helicopter before the Beetle. In parts one and two of this series I explained how this sort of model has gotten a lot more complicated. Thanks to newer parts and techniques, the simple solutions I would have been happy with ten years ago just don’t hack it anymore. In this third and final part, I finally unveil the finished article. 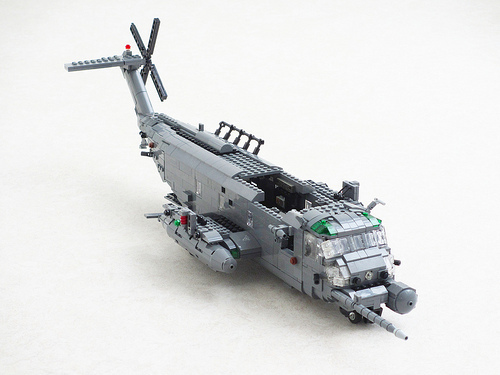 Progress on my Pave Low helicopter has been slow. In Part 1 of this series, I explained how I am using new parts and techniques to build an up-to-date version of the model I built ten years ago. In this second part of a short series, I’ll explain one of the difficulties I ran into. 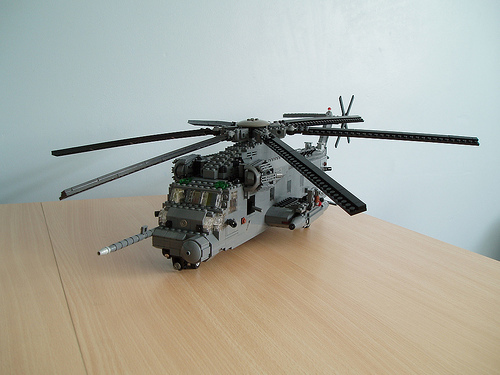 I plan my models such that actually building them is usually a fairly straightforward process. I used my old model as a template and had an idea of how to do most of the other things in my head. As a result much of the model so far indeed came together quite easily. Note the words “usually”, “most” and “much” in those last three sentences. The tail on my old model was quite narrow and I wanted the new one to be wider, using curved slopes and bricks. However, the fin is tilted aft at a roughly 45 degree angle, with a horizontal fin on top of it. I only had a loose idea of how to this. Actually building it took about eight frustrating hours of tinkering and trial-and-error. The diagonal part is attached to the tail boom using clips and plates with bars. The horizontal fin uses a similar attachment. A major problem was positioning all of this at the proper angle. I wanted as few visible gaps as possible and the tail should also be reasonably sturdy. This was asking rather a lot. The result is an improvement over the old one, but I’m still not completely happy. This article is the third and final installment in a series. 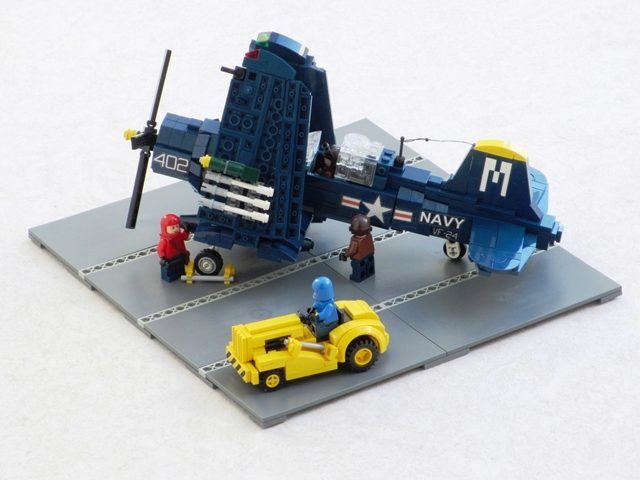 Read about the LEGO Grumman E-1 Tracer Part 1 and Part 2 here. 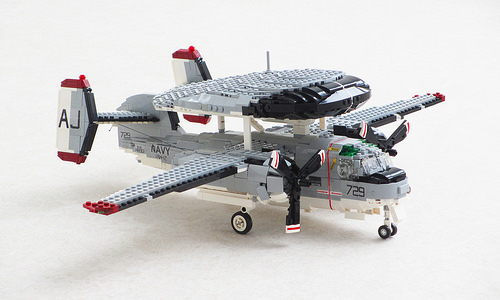 In the last four weeks, I have been building a LEGO scale model of a Grumman E-1 Tracer aircraft. Part 1 described how I planned the build, and part 2 dealt with how I built some of the difficult bits; in this, the third and final part, I explain how I built the last bits, and present the finished model. For weeks this build seemed to progress really slowly. I know that for some builders September means building huge spaceships. It took me most of this month to build just the radome, the nose, the wings and the engine nacelles. When I started building the fuselage, however, it felt like I had reached the home stretch. All of a sudden things went really quickly. Building the final parts wasn’t necessarily easy, but certainly easier. It was great to see the collection of separate sections come together into something that looked like an aircraft. The anticipation of seeing the end result motivated me. So, here it is.